Acer mobile unveils its dual core smartphone, named Acer Liquid Z3. An affordable smartphone set to be released in mid-August 2013. Featured with Quick mode profiles, that lets you choose on how you should deal with your phone, for example, the senior mode comes with weather, magnify, quick call contact, and clock. Other functions include the classic mode, basic mode, and keypad mode. 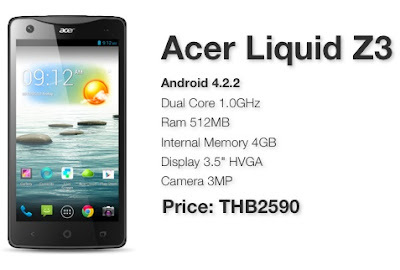 Not only Acer Liquid Z3 is flexible to use, it is also featured with Dual SIM, that enables using 2 GSM networks, specifically for work and play. Running on the Android Jelly Bean 4.2, app compatibility will not be an issue, just download any app you like on Playstore and install it on your device. Price is still unknown as of now, rumors says it will price for Php6,100+. Available this August in Europe, and probably in the Philippines after that. What can you say about Z3? Whats your estimated price? Kindly share your thoughts about this, thanks.